Salem / Mid-Valley Links | Oregon / National Links | Charities | Past Events | Contact Us! The Capitol Forum is an organization that has been involved in the Salem community since 1977. Its purpose is to be a non-profit, service, social organization serving the needs of the individual, especially those residing in Marion, Polk, and Linn Counties. We welcome and encourage you to join us as we continue to work towards making Salem a true City of Peace. 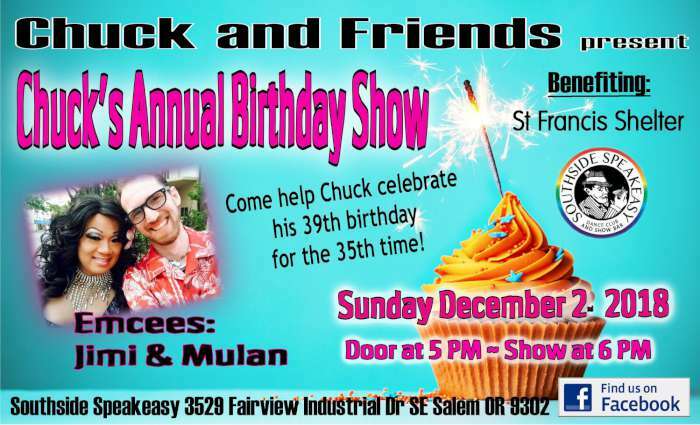 Join us to celebrate the 35th anniversary of Chuck's 39th birthday on Sunday, December 2, 2018. This fundraising event is being held at Southside Speakeasy in Salem and benefits St. Francis Shelter. Emcees are Jimi & Mulan. Doors open at 5 PM. Show begins at 6 PM. Click here for the event flyer. >We are in need of donated items for raffle and auction such as gift certificates, gifts, t-shirts, items to make gift baskets, etc.. We hope you will help. We have a special OLCC permit to raffle and/or auction alcohol items (liquor, wine, & beer – single bottles or in gift baskets) for that night only. We are also asking for Sponsors for the show. Click here for sponsor information. Thank You Sponsors! We couldn't do it without you. Check out our list of sponsors who have made this benefit show possible. Let them know you appreciate their involvement to help make the local community a better place for everyone. © Copyright 1977-2018 The Capitol Forum of Salem, Oregon. 1808 Berry St. SE, Salem, Oregon 97302. All Rights Reserved. Webmaster: Email. Updated: October 27, 2018.